HD digital cable service with HBO is complimentary in each of our Maui condos. Hi-Speed internet is available in all of our condos. The hi-speed modem is located near the television and instructions are provided. Should you experience any problems with this service, call the Spectrum Cable help desk at (888) 406-7063. 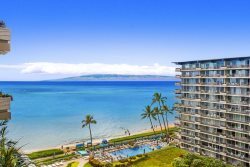 The gym offers our Maui condo rental guests various cardio equipment, including tread mills, elliptical trainers, a rowing machine, stationary bikes, and free weights. Located in the lower level of Tower 1, the gym is open from 6:30 am to 9:00 pm daily. The dry sauna is located inbetween the Salon & Gym. It is also open between 6:30 am to 9:00 pm daily. Tennis courts and complimentary equipment are also provided for guest use. Excitement for children ages 5-12 years old. Activities include beach exploration, kite making & flying, hula dancing, lei making, ukelele, swimming, scavenger hunts and arts & crafts. Monday-Wednesday-Fridays 8am - 2pm and 5pm - 9:30pm, $35.00 + $10.00 registration fee per child. Booked at concierge desk, call 808-661-6032. Schedule may vary by season. Complimentary high efficiency washers and dryers are located near the elevators on each floor, for guest use. Underground parking, poolside & lobby refreshments, airline boarding pass printing, internet kiosk, ocean-front BBQs, heated swimming pool and hot tub. In addition, we provide a complimentary "starter kit" of supplies: paper towels, garbage bags, dish detergent, dishwasher detergent, new kitchen sponge with scrubber; several rolls of toilet tissue, kleenex, hotel-size bar soap, shampoo, and lotion. Please note that the starter kit items are not replenished. You can reach our office at (808) 667-9703 Monday - Friday from 8:30am - 5pm for assistance with your Maui condo rental. For after-hours issues, our cell phone number is (808) 292-4945. The Whaler Vacation Rental Program by Monte D. Fitts, Realtors manages all aspects of property management for our owners and guests including maintenance problems and housekeeping concerns. The front desk may not be able to assist you and instead, direct you to contact our office.